Stampin' Up! UK Demonstrator - Teri Pocock: New Spring / Summer Catalogue - And ..... Sale-a-Bration Begins! New Spring / Summer Catalogue - And ..... Sale-a-Bration Begins! The new Spring / Summer catalogue is out today! Click on the picture above to view and/or download this fabulous catalogue full of exciting new products! This catalogue will run in conjunction with our Annual Catalogue until 31st May. Sale-a-Bration also starts today. This is Stampin' Up! 's biggest promotion of the year .... and your chance to get lots of FREE goodies! Click on the picture above to view and/or download the Brochure! This Promotion runs until 31st March. Things are a little different this year with the inclusion of a couple of larger valued FREE items available with a £90 purchase. For each £45 you spend on an order, you can choose 1 x FREE First Tier item from the Sale-a-Bration brochure. OR If you spend £90 on an order, you can either choose 2 x FREE First Tier items or 1 x FREE Second Tier Item. If your Party makes sales of at least £200, then you will earn an ADDITIONAL £20 in Stampin' Rewards. Therefore a £200 Party (or order) will earn a total of £40 in FREE Stampin' Rewards. Note: Remember, you can also put any Stampin' Rewards earned towards the cost of the Starter Kit! 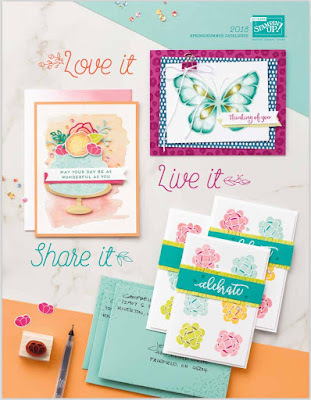 Join Stampin' Up during the Sale-a-Bration Promotion and receive TWO additional FREE stamp sets with your Starter Kit. This is an extra value of up to £90! The Starter Kit costs £99 and you can choose £130 worth of products in your Kit. 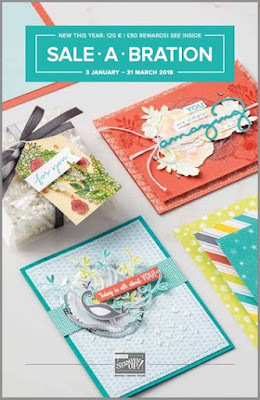 Plus you get to choose the extra 2 FREE stamp sets and will also receive a FREE Business Pack containing catalogues, order forms etc to get you started.